Here are some easy to make bracelets! All the kumihimo projects are basic 8 warp round (knogoh gumi) braids and were made on the foam kumihimo disk. Instructions for using the half bracelet finding area at the bottom of this area as well as in the JTV projects tab. 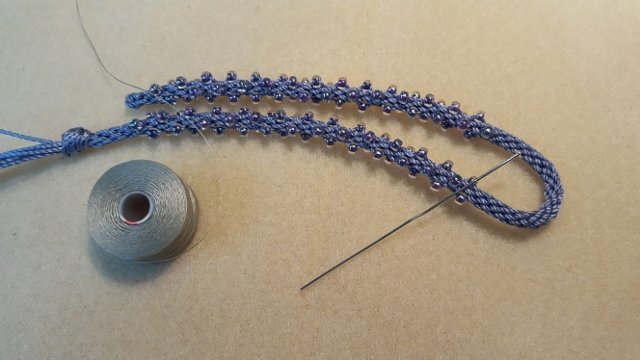 Magatamas present a bit of a challenge when using them in a braid and you should make a few projects with rocailles prior to trying magatamas. I've posted some information about the subject under the "FAQ" button. 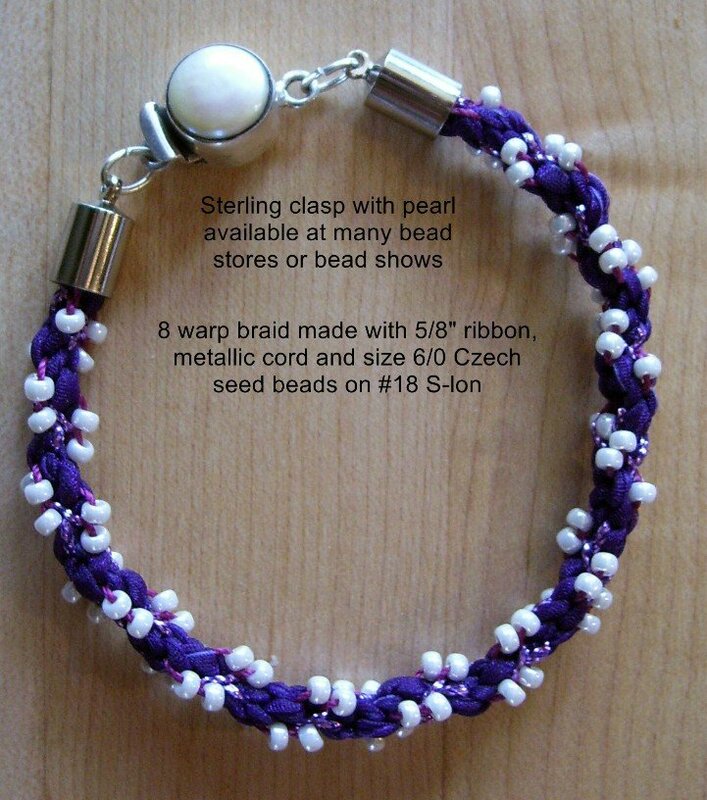 This bracelet requires 25 grams (184 beads; more if you want the entire bracelet to be magatamas). The beads were loaded in the "alternating" pattern. 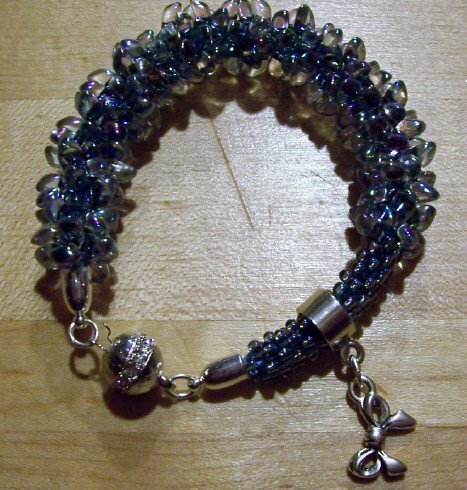 Below is a simple finger woven bracelet. 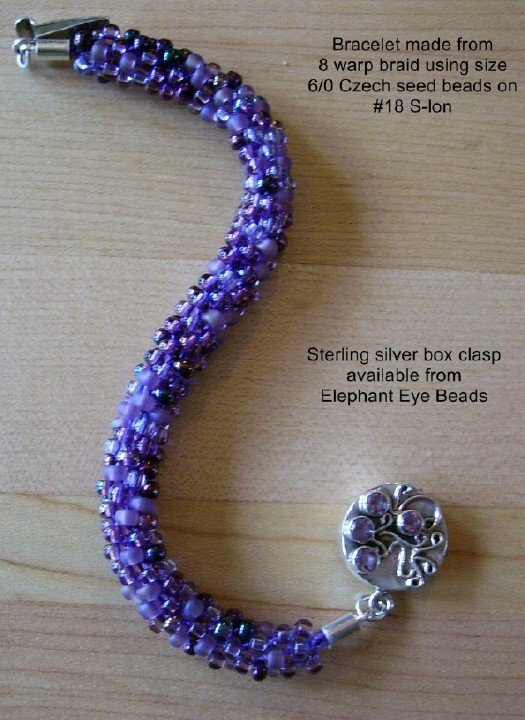 This technique is a great way to clear out your bead stash. The Classic fan pattern in macrame is greatly impacted by color. 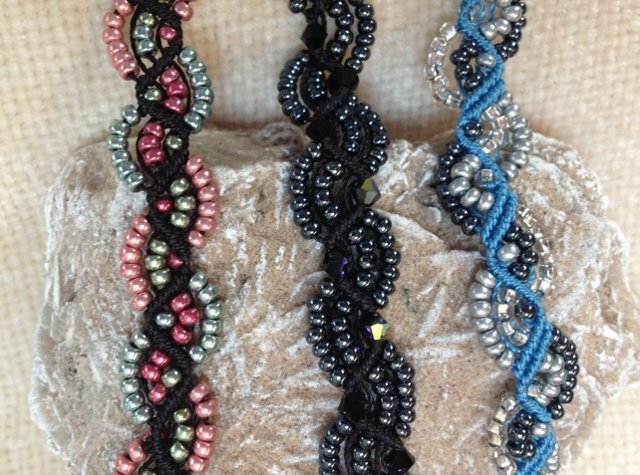 These 3 bracelets are all the same; just different color beads and cord. Half Bracelet Findings with kumihimo. These findings were designed to be used with leather but they're great for kumihimo and other types of cording. 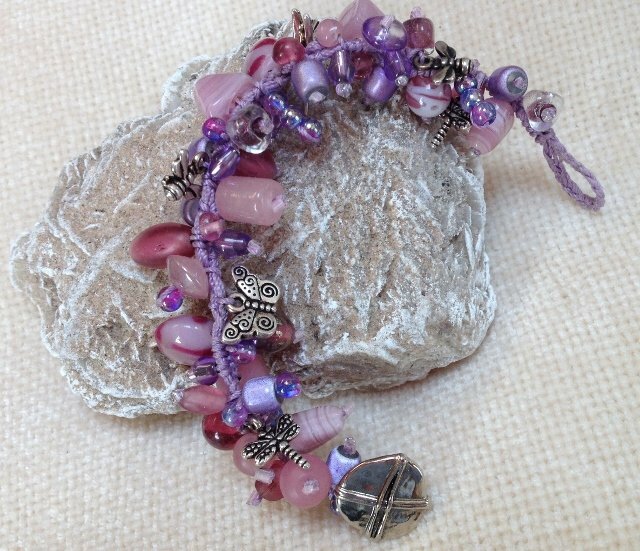 Here's how you make a braid for use with the half bracelet finding. The finding opening is 8x4mm. Tex 400 S-lon will make a 4mm braid, so two 4mm braids glued side by side will give you the 4x8mm cording for the finding. 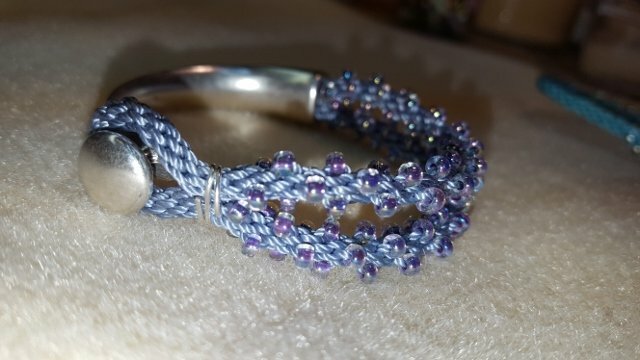 The area required for the loop that goes over the button requires 2" of unbeaded braid and the finding will add 4" to the length of the bracelet. So, here we go: make 1/4" with no beads, make the first beaded portion of braid, make 2" of unbeaded braid, make the second portion of beaded braid, make a 1/2" of unbeaded braid (this gives you room to whip and cut). Glue the unbeaded portion into the finding, allow 24 hours to dry. Use wire or s-lon to make the loop closure for the button on the finding. 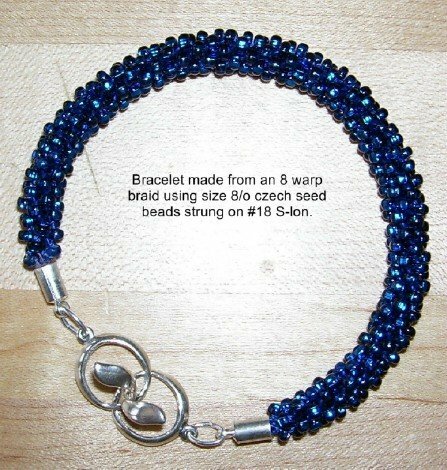 Figure the length of beaded braid by subtracting the length you want the overall bracelet minus the 4" for the finding. So, for a 7" bracelet you'll want 3" of beaded portion on each beaded section.